"Family. There were eight boys and three girls in our family. We grew up as a "unit of oneness." Where the hurt of one is the hurt of all and the honor of one is the honor of all. Our parents guided us with kindness and compassion and took care of our basic needs, but also stressed upon us the importance of caring for one another. Secondly, since we lacked modern conveniences, we were able to use our imagination and be creative in our thinking — from making toys with rocks, hunting, developing games to being artistic." "Three basic differences. Media, Mobility and Employment. Media enables us to know what the rest of the world is doing, current events, communications. Mobility, no longer confined to the Pueblo, able to travel places we only dreamt about. Attend schools, universities, access to shopping centers, etc. Employment, educational employment is available on the reservations through economic development programs or nearby cities/towns. This enables the majority to sustain a good standard of living. Unfortunately, as an agricultural people, we no longer farm or grow crops as before." "All things that were here before the Europeans arrived — songs, dances, ceremonies, rituals. We "ALL" pueblos live in two worlds. Adapting to the ways of the dominant society yet still maintaining all tribal ceremonies." 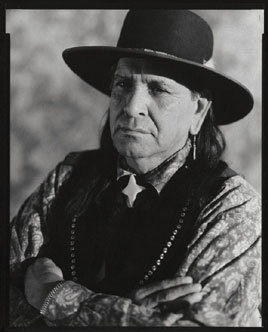 "It is not only an honor for me, but for my family, my tribe, and native people. Mr. Auerbach is a person who I believe respects the way of life of our people. He made me feel important to represent our peoples; therefore, I didn't hesitate to work with him and his lovely assistant, Tamara." "Unfortunately, because of the inter-tribal and inter-racial marriages, the tribes are losing the native tongues and songs. This is simply because the first language learned is English. Secondly, the move of the US government to abrogate all treaties with Native Americans — we are in danger of losing our tribal rights and sovereignty."